Head distiller Brendan Wheatley washes down the floor of the distillery at the Nauti Spirits Distillery in Cape May. Growing up in Newtown Square, Dorey Bryan dreamed of one day owning a horse farm that backed up right to the beach. She ended up instead with a distillery that makes small-batch vodka out of New Jersey sweet potatoes, and she couldn't be happier. Bryan, along with her husband, Corey, and partner Steve Miller, are the founders of Nauti Spirits, a nascent operation that honors Cape May County's booze-soaked history and terroir in more ways than one. 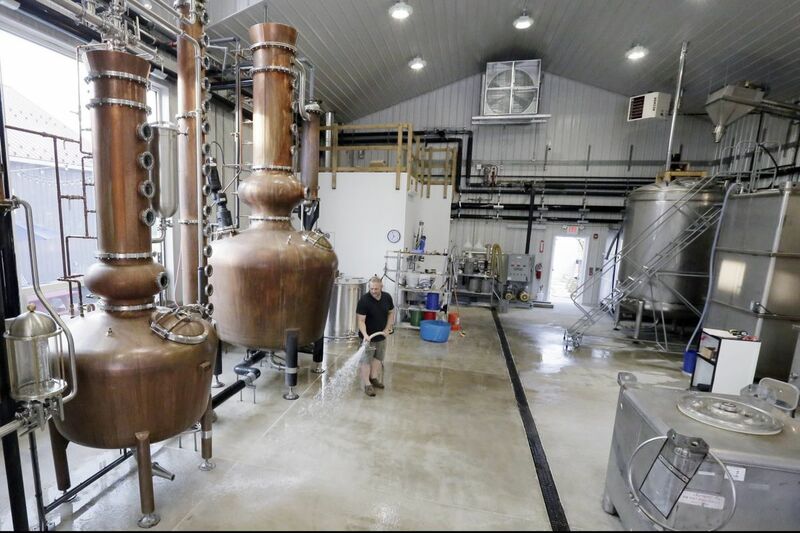 On a 60-acre preserved farm that sits right on the Cape May Canal, the not-yet-two-month-old Nauti proudly touts itself as a "farm-to-bottle" operation — the stuff coming off their stunning 750-gallon, 23-foot-tall copper still is largely derived from raw material plucked from local fields, providing cocktail-loving beachcombers with a literal taste of the shore, sans the sand and salt water. Taking this hyperlocal tack is not just preferred from a craftsman's standpoint — it's actually dictated by law. Since Nauti is designated as preserved farmland by the New Jersey Department of Agriculture, it is required that a minimum of 51 percent of its annual gross sales come directly from the output of the farm itself. In other words, they've got to make their money off what they grow — which is where those sweet potatoes come in. South Jersey farmland is known to be particularly friendly to the sweet potato, which can be difficult to cultivate in other climates. After Nauti's founders sampled a few sweet potato-based vodkas made in other states, they decided on the crop as the source material for their first spirit. Right outside the distillery are 10 acres of sweet potatoes that should yield 10,000 to 16,000 pounds of product. (The 750-gallon still goes through close to 8,000 pounds of potatoes per run.) While it waits on that harvest, Nauti is working with potatoes grown on leased farmland in nearby Vineland to produce its flagship product, a versatile 80-proof vodka with subtly sweet vegetal notes. This week, Nauti's second spirit, a straw rum distilled from (nonlocal) molasses, became available for purchase at the distillery, with some stored in barrels for aging. On deck is a 92-proof gin infused with botanicals ranging from the requisite juniper to cinnamon, coriander, and anise. The farm has a one-acre test field of corn planted that will aid in experimentation with whiskey, and they're also toying with Jersey-grown wheat and rye provided by their farming partners that will help them hone their approach to brown spirits down the line. Corey and Dorey Bryan, who are year-round residents of Cape May, met playing on the beach as kids. They have been hunkered down on their farmstead for two decades. Dorey started out in banking before leaving that industry to become a full-time mom to her two children. Corey, the son of a Coast Guard officer, operated his family's restaurant, The Lemon Tree, in town for years. When it sold a few years ago, the couple began exploring the options for their second careers, hoping to put to work the valuable but mostly fallow acreage surrounding them. The idea of creating Nauti was born of conversations with Steve Miller, a "beach friend" who wanted to launch a farm-based craft distillery but had no land. A Washington, D.C., lawyer who does work in the energy field, Miller found enthusiastic partners in the Bryans. The trio got to work about four years ago on restoring the farm to shipshape form. "I never considered doing this anywhere else," says Miller, who splits his time between Cape May and his home in Annapolis. Prior to his private law career, Miller was a lieutenant commander and JAG Corps officer in the U.S. Navy, who left the service in 1999 after close to a decade of active duty. This partially explains the "Nauti" moniker, but it has just as much to do with Cape May's colorful maritime history as it does with Miller's résumé. If you watched Boardwalk Empire, you already know: During the Prohibition Era, from 1920 to 1933, the Jersey Shore – and Cape May in particular – was an extremely active hub of illegal rum-running and bootlegging. Spirits were acquired in the Caribbean and smuggled onto American shores via specially equipped schooners and skiffs, in addition to the fiery "bathtub gin" produced and distributed on the ground by locals. It's one reason the U.S. Coast Guard's primary East Coast training hub is located right in town, just 15 minutes from Nauti. To give you an idea of the numbers that rum runners were putting up at the time, the Asbury Park Press reported in January 1925 that the Coast Guard seized close to 13,000 cases of contraband liquor, worth half a million dollars on the street at the time, in the 1924 calendar year alone. And that's just what they intercepted. "There are older people [in Cape May] who had parents who were, let's just say, 'involved,' " Miller jokes of the "naughty" local precedent that also served as inspiration for the distillery's homonymic name. The partners had the concept, the land, and the passion for the process to get the ball rolling. ("It's art, science, and magic mixed together," Miller says of distillation.) Then they hired Brendan Wheatley as the master distiller to translate their goals into sippable results. Wheatley, a California native, has trained around the world in disciplines ranging from classical French cognac-making to Japanese whiskey. The position appealed to him as an opportunity to capture the essence of Cape May in a consumable format, expressing the personality of the soil. "I really want this environment to make its own spirit," says Wheatley. "That's really the key to doing stuff that's unique." Like most new distilleries, Nauti is taking it slow and steady as it figures out exactly how the owners want to express their point of view. Whatever direction their distilling takes, their goal is spirits that taste like Cape May. "We're not interested in vodka or whiskey or rum that is made in Jersey," says Wheatley. "We want to make Jersey vodka and Jersey whiskey and Jersey rum. This environment should produce its own thing, because great things come from places."